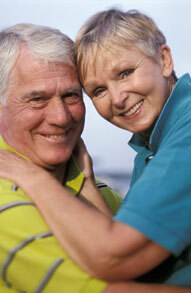 Dentures from A. Joshua Montgomery D.D.S are a removable replacement for missing teeth and adjacent tissues. It is made of acrylic resin, sometimes in combination with various metals. The denture at process A. Joshua Montgomery D.D.S. takes about one month and five appointments: the initial diagnosis is made; an impression and a wax bite are made to determine vertical dimensions and proper jaw position; a "try-in" is placed to assure proper color, shape, and fit; and the patient`s final denture is placed, following any minor adjustments. First, an impression of your jaw is made using special materials. In addition, measurements are made to show how your jaws relate to one another and how much space is between them (bite relationship). The color or shade of your natural teeth will also be determined. The impression, bite, and shade are given to the dental laboratory so a denture can be custom-made for your mouth. For more information on dentures, call our Springfield, MO office at (417) 883-2111 today!